The Scottish Cafe & Restaurant at the Scottish National Gallery, Edinburgh, has won the top ‘Sustainable Business Award’ at the Catering in Scotland (CIS) Excellence Awards 2018. The CIS awards, which took place on 31 May at the Doubletree by Hilton Glasgow Central, were launched in 2004 to recognise, reward and celebrate the exceptionally high degrees of creativity, innovation and excellence in the Scottish hospitality, catering and tourism sectors. 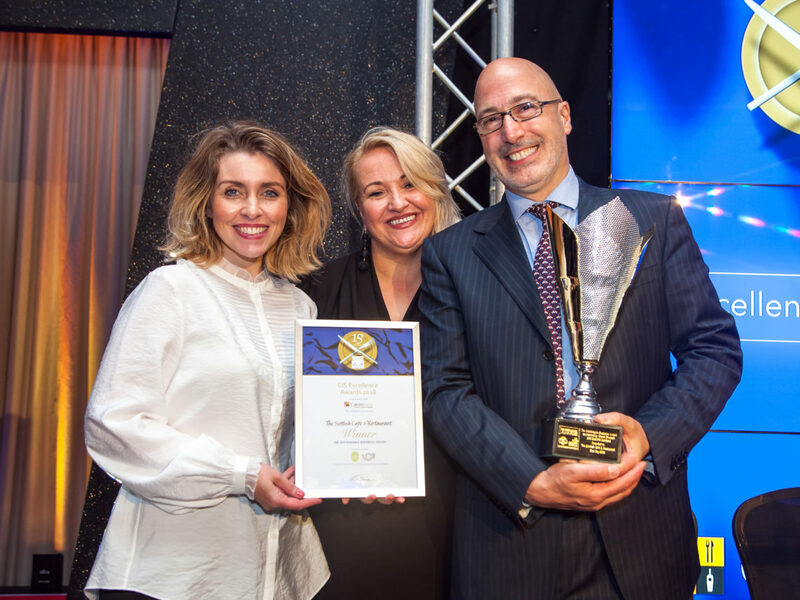 Having established themselves as the most prestigious accolade for Scottish restaurants, the awards ceremony welcomed guests including world-renowned chefs, prominent hoteliers and restaurateurs to celebrate the achievements of Scotland’s very best establishments. The Sustainable Business Award, which was co-sponsored by Green Tourism and Seafood Scotland, celebrates businesses working within the Scottish catering, tourism or hospitality sectors, which have excelled in reducing their environmental impact over the past 12 months. A team of industry expert judges singled out The Scottish Cafe & Restaurant for the top award based on its company-wide commitment to environmental awareness, energy-efficiency, waste reduction and sustainable business practices. The independent, family-run cafe and restaurant, was also commended for its strong commitment to sourcing Scottish, local, sustainably produced food and drink, as well as a proactive waste-reduction strategy and training initiatives that encourage and incentivise employees to consider implementing sustainability options and best practice. Carina Contini, owner of The Scottish Cafe & Restaurant at the Scottish National Gallery, commented: “We’re honoured to have been recognised by Catering in Scotland for our passionate commitment to sustainable business practices. “We dedicate a huge amount of our time to sourcing produce direct from the very best suppliers from across Scotland, with 90 per cent of ingredients coming from more than 70 trusted Scottish artisan producers, including some of those our grandparents worked with. The Scottish Cafe & Restaurant’s green credentials also include a Green Tourism Gold Star accreditation and a VIBES – Scottish Environment Business Awards Commendation in 2017. Located within the Scottish National Gallery on the Mound, The Scottish Cafe & Restaurant serves breakfast, lunch, afternoon tea, high tea, and Sunday brunch. Carina Contini and her husband, Victor, also own the award-winning Contini George Street and Cannonball Restaurant & Bar on Castlehill, Royal Mile, Edinburgh.